At The Heirloom Companies, we pride ourselves on combining old-world craftsmanship with new-age technology. To that end, we've assembled a team of gifted individuals that excel in traditional skills as well as masterful understanding of the latest technological advances in our industry. While some of our artisans focus primarily on wood and others are more devoted to metalworks, the overlap and understanding is seamless. The value that Zack brings to The Heirloom Companies is significant. He wears a different hat every day - sometimes multiple hats. Depending on the need, he may help run the day to day operations...draft a proposal...help the artisans out in the wood shop or the iron shop...or jump in with both feet to meet a rush deadline. "What I appreciate about Zack is his versatility," says Ben Moseley. "His talents are multifaceted and when coupled with his company-first attitude, it makes him a pleasure to work with. I know I can count on him." 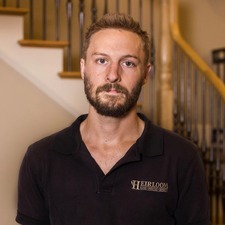 Zack was first introduced to Ben and Heirloom in 2009, when he worked as a project manager at a site for former Spartanburg Mayor Bill Barnett. In a very short time a mutual respect developed. "When Zack became available I knew he would be a great fit because of our shared vision, so we pursued him hard," says Ben. "His learning curve flattened out very quickly and his commitment to what we do is second to none." For his part, Zack loves the variety. "Every day is a new challenge and a new reward," he says. "We have a great team with some very dedicated, talented people and that keeps me inspired." Joe Cooper "fell under the spell of the torch" in 1968. From that pivotal moment there was no turning back for Joe. The magical art and process of welding copper and bronze into new creations would define his lifelong journey. "I guess I'm what you call a left brain-right brain individual," says Joe. "I have a degree in engineering from Georgia Tech, but I also studied Anthropology in graduate school at Tulane to indulge my lifelong interest in culture and rare artifacts." Today, Joe is an artisan of the highest order, shaping, fashioning, and molding "textured bronze" light fixtures that are unique, elegant, and lasting. "I discovered this process a long time ago with a man named Lee Robertson who lived deep in the Ozark Mountains," says Joe. "It's basically taking copper and hand welding it with a bronze alloy to create something new, that looks old and timeless. By joining copper and bronze in this way I discovered that the process wasn't a means to an end - rather, the process was the end. By highlighting the weld, I was able to shape these textured bronze light fixtures into functional pieces of art that last forever." Jessica was raised in Landrum, South Carolina and has always had a love for the Campobello area. 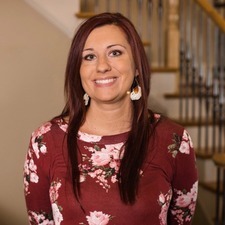 She graduated from Landrum High School before going to Spartanburg Community College where she majored in Engineering Technologies and earned her CAD certificate. Jessica now has over 15 years of CAD drafting with purchasing materials experience. Engineering and design has always been a passion of hers and says the “beautiful, unique designs and wonderfully talented people who make them happen” are what drew her to The Heirloom Companies. When not at work she is a mother of two boys, one girl, and a Chihuahua! Jon is the "smart tech guy." Every company has one (if they're lucky). 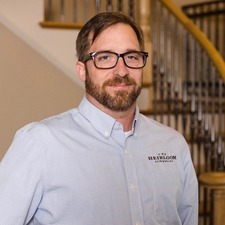 He's the technologically savvy guy who oversees the network and the highly sophisticated automated equipment, including the ArtCam, CNC Router, and CNC Plasma, among others. In his role, Jon serves a key function for The Heirloom Companies, one that was always a priority with founder Allyn Moseley. "Jon's background is in computers," Allyn says. "He worked for years at Intel in California. All along my goal at Heirloom was to marry modern technology with old world craftsmanship. Having a talented guy like Jon, who can harness this technology and apply it to the inspired designs our artisans create, gives us capabilities that few others in the industry can match." Jon's skills and technical abilities enable Heirloom to produce very precise designs, right down to the centimeter. "I oftentimes CNC cut a full scale print out of plywood," Jon says, "and then our guys will build directly on that. It helps us to be exact in our dimensions, which is important to both homeowners and contractors." Hank is a problem solver and, like so many others at The Heirloom Companies, he wears a lot of hats. 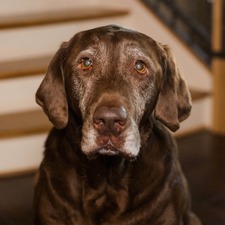 As manager of the Wood Shop, Hank's first responsibility each day is to make sure the crew in the field has everything they need to stay on task and on time. "We don't want them to stop," Hank says, "down time is the enemy. The goal is to always have them up and running." 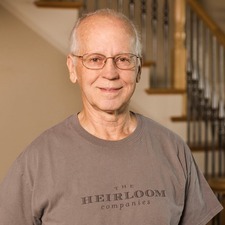 Having worked at Heirloom for many years now, Hank has become a go-to-guy for difficult tasks or custom projects. "Hank is really good at figuring out how to make things work," says Ben Moseley. "Whether the project calls for a circular staircase, or custom woodwork, Hank can get it done right, and get it done fast." In fact, to put that into perspective, Hank can start building a circular staircase on Monday, from scratch, and have it completed and ready to be installed by that Friday. Hank also has two boys, Hudson and Reuben, who have followed their dad's example and are now working at Heirloom. It's a family thing. While Michael is one of the newest members to join the Heirloom team, he is by no means a novice. 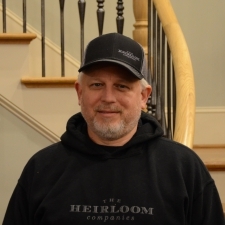 With over thirty years of construction experience, he brings a level of know-how to The Heirloom Companies that is unmatched. His day to day operations include the coordinating and scheduling of our many projects and employees. This integral duty keeps the completion of our numerous daily projects occurring on time. 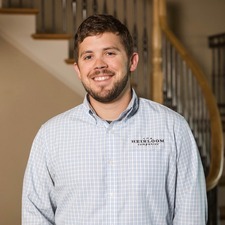 In addition to scheduling, he also utilizes his construction background by providing project management, writing estimates, working with suppliers, and meeting with clients for product selections. When asked what he most wants to accomplish, Michael said he’s interested in helping the company grow and succeed in new areas. It all started in 1994. That's when Allyn and Sheree Moseley packed up their belongings and traveled some 3,000+ miles - from Placerville, California to Greenville, South Carolina - with the singular goal of finding a good place to raise a family. "American history is filled with adventurers and pioneers heading west," says Allyn. "We did the opposite and headed East. That's where our rainbow set." As it turns out, Upstate SC was not only the perfect place for the Moseleys to raise three sons - Ben, James, and Travis - it was an ideal location to start a business. Originally opened under the name "Heirloom Stairworks," the company now incorporates two additional divisions: Hand Forged Design and James Moseley Design. "The best part about The Heirloom Companies," says Sheree, who designed their current showroom, "is that it truly is a family company, and by family that extends to everyone here who has grown with us over the years." 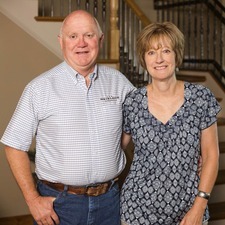 While much of the day-to-day has been turned over to their sons, Sheree still keeps the books and oversees accounting, just as Allyn spends much of his time in the shop working. "I get antsy sitting behind a desk too long," he says. Ben keeps the engine running. He is able to dial in quickly, cut to the chase, and get from A to B effectively and efficiently. As the oldest of Allyn and Sheree's three sons who work at The Heirloom Companies, Ben is in charge of operations. "James and I are two sides of a coin. He is the true artist, and creative type," says Ben. "Whereas I am much more linear and business focused. I have to make sure the systems are in place, that we stay on task, and execute, and plan, and make deadlines, and above all, keep our customers happy." Soon after Ben graduated from The Citadel in 2001, he started at Heirloom, "sweeping floors and doing whatever dad asked me to do." Together, years later, he and James worked together to build the Hand Forged Design line of products. "We literally learned together," he says, "and that meant on the fly, even if that involved fabricating rails in the back of the truck, in the driving rain, or in the blazing sun. Whatever it took." Today, Ben's constant goal is to keep pushing and evolving. "I don't ever want to get complacent. We do great stuff, and we have grown a lot over the years, but we can always get better. My driving passion is to keep that fire burning so we can reach new heights in the future." James loves to create. He enjoys taking a conceptual idea or vision and turning it into a lasting piece of art or furniture or decorative piece. "The best part of what I do is seeing the expression on a customer's face when we first present our finished product to them," James says. "To see their excitement and to realize we met or exceeded their expectations is very gratifying." James has been creating and "making stuff" for as long as he can remember. "I was always building stuff," James says, "little designs or structures made with whatever I could scrounge up in a creek bed - rocks, twigs, branches. I guess I was born with a desire to create." Like his brother Ben, James had worked with his dad at the shop as a kid, sweeping floors and "doing basic grunt work." The turning point for him came when his dad asked, "If I buy a welder do you think you can make money with it?" James said yes. And since that day back in the late 1990s, James has emerged as one of the finest, most highly skilled forgers and metal works designers in the country. "It's my passion," James says. "It's what I love to do. I am grateful that I have an opportunity to do this for a living, with friends and family and so many talented craftsmen." With his older brothers (Ben and James) already working at The Heirloom Companies, it would seem obvious that Travis would follow in their footsteps. And, in fact, he did, although that wasn't the original plan. 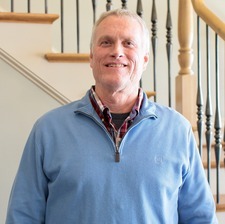 "I went to the University of South Carolina with the idea of being an orthodontist," Travis says, "but after a year I realized I didn't really want to do that for a living. My heart was at Heirloom." Upon graduation in 2009, Travis followed his dream - and wound up sweeping floors, painting walls, and laying tile, just like his brothers before him. Eventually however, he "earned his stripes," and gravitated upward to the hand-forged metal side, where he is now Production Manager, overseeing the day-to-day operations. "Growing up I had worked in the wood shop with dad, and in the iron shop with James," he says. "What I realized was that I like the variety that forging different metals allows. There are so many possibilities. It's a lot of fun." Mike embodies The Heirloom Companies commitment to combining old world craftsmanship with modern technology. 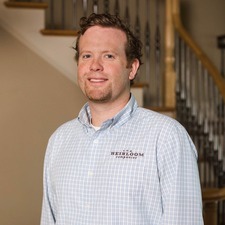 Working as an architectural designer with Jacobs Engineering prior to joining the Heirloom team, Mike has a deep knowledge and understanding of the possibilities AutoCAD brings to our team of artisans. As a child Mike was artistically inclined, with a fascination for drawing that he cultivated into his teens. That has served him well in his current roll today. Mike will take the initial drawings or sketches from the artisans, and create precise blueprints or drafts for the team to ensure that the design is "do-able" and will translate optimally from the concept stage to real world functionality. "I love the variety my job brings each day," Mike says. "It's very gratifying working closely with our craftsmen to help create legacy pieces for individuals that exceed their expectations." Hudson wears a lot of hats at Heirloom, just like his dad, Hank Knights (Woodshop Manager). "What I like best about my job," Hudson says, "is that I get to work on a lot of different projects, both in the shop and out in the field." Among his many duties, Hudson goes onsite to install interior staircases, as well as wooden rails, balusters, remodels, and whatever else the job calls for. "Every job is different," says Hudson. "I like problem solving and finding unique solutions to the unforeseen challenges that each installation project brings." Jake Boiter was introduced to the Moseleys by a mutual friend a few years ago. 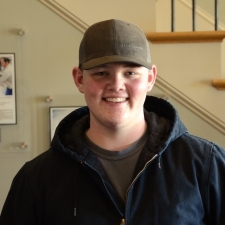 After their first meeting, he was hired to join The Heirloom Company team as a welding and metal works fabricator. "I'm responsible for building most of the metal rails, cutting down the material, punching it out, then detailing it to make sure it's ready for installation." 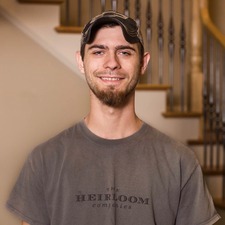 Since Jake began with Heirloom in 2011, his role has grown to oversee some projects in addition to his fabricator role. 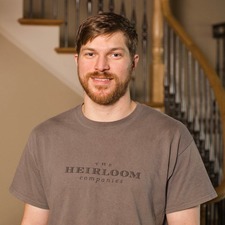 Jared recently joined The Heirloom Companies, along with Joe Cooper, who Jared worked for at J.T. Cooper Studios. Working closely with Joe, he has mastered the art of "textured bronze" - a process of welding copper and bronze together to create gorgeous lighting fixtures. Most of Jared's work focuses on copper welding and brazing. He also has a thirst for knowledge and is always watching and learning new techniques and skills in the metal works division. When John first read about the Moseley family in Fabricator magazine, he had no idea he'd one day be working with them. 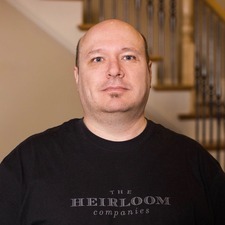 A native of Augusta, Georgia, John has been with The Heirloom Companies since 2013. 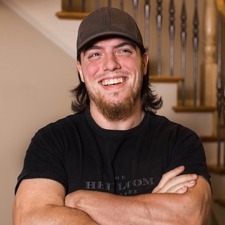 With a Bachelor's degree in Fine Arts from the University of Georgia - and a passion for sculpting and forging - John had his own high-end residential iron works shop prior to lending his creative talents to the Heirloom team. 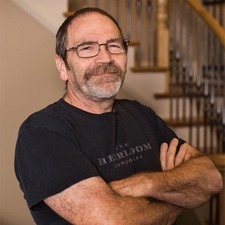 Primarily, John focuses on intricate railings, custom furniture, fire screens, and lighting, often working directly with interior designers and customers. With a Fine Arts degree and a desire to design, Josh enrolled in welding school a few years back and eventually stumbled upon The Heirloom Companies. "A friend of mine, a local interior decorator," says Josh, "had worked with the Moseley's in the past and suggested I get in touch with them." After one meeting, both sides agreed "this was a good fit." Josh is primarily a blacksmith, helping create custom forged metals in a variety of applications. Like so many artisans at Heirloom, he has not only grown individually as an artist, but he has contributed to the very lofty standards that the entire team has built together. Ryan is a finishing expert at Heirloom. He assists in applying custom, faux, or clear finishes to a variety of wood and metal pieces. "We do a lot of patinas on metals," he says, "as well as various stains on wood. One of the trademarks of Heirloom is our ability to seamlessly cover up the weld, whether it's copper, bronze, iron, or basically any metal." In addition to a bright future, Ryan has a history with Heirloom: his father-in-law worked here before him. Born in Long Island, New York, Mike moved to North Carolina with his parents when he was 17. His parents had always dreamed of living in the South and ultimately settled on the riverfront town of Wilmington. Mike brings classic blacksmithing experience and has hands-on experience sandblasting and powder coating. 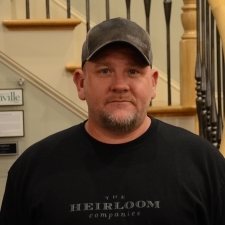 In 2015, he joined the Heirloom team and has been a great addition to the metalworks division. 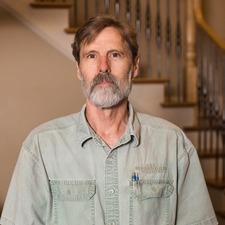 Ben graduated from Greenville Tech and has worked in architectural design for over 25 years, working on large industrial projects, small residential, and small and large commercial projects. 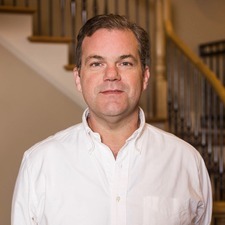 He spent a lot of time at large companies and designed houses for mid-level subdivision developments in Greenville. Ben has both a technical and an artistic mind, which explains his love for pencil drawing and design. He also likes challenges, puzzles, learning new things, and studying subjects that don't apply to most peopl'’s real lives. 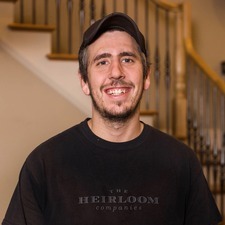 Ben loves the detail that everyone at The Heirloom Companies goes into, the reputation of the company, and their focus on quality as well as the family atmosphere. 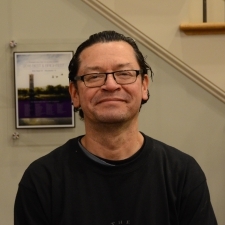 Mark has been a craftsman in the woodworking industry for over 25 years. His expertise and knowledge provide a definite advantage for The Heirloom Companies. Altogether, Mark has worked for Heirloom for a total of 13 years. He has been married for 23 years and has two children. 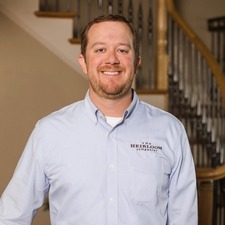 Mark says, "I enjoy doing challenging projects and I love what I do". 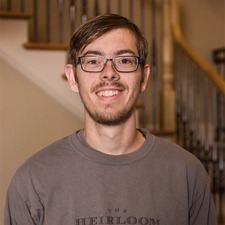 David started working at The Heirloom Companies at the beginning of 2018. He is responsible for making sure the wood and iron shop are clean and organized. David's job sometimes calls for versatility and he will often assist on installation projects. "David gets thrown in a lot of different directions and he handles it well" says Travis Moseley. It is evident that he has strong family values. He is a proud son, brother and uncle to 2 nieces and 3 nephews. Although a new member to the team, Jason is no stranger to the trade. He has 25 years of experience in the construction industry doing trim work and carpentry. Ben Moseley had met Jason on various job sites over the years. 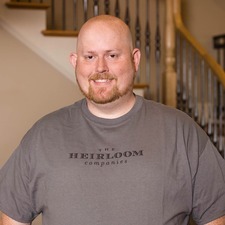 He stated he was excited to have Jason join the Heirloom team because he "knew both the quality of work Jason was capable of and also the quality of person he exemplifies". Jason is a true outdoorsman. He enjoys hunting, fishing, and camping with his two boys, Parker and Inman. Cree is a new face to The Heirloom Companies. His responsibilities include, but are definitely not limited to welding and assisting with shop organization. Travis Moseley states that Cree "has an enthusiasm for learning the trade and shows great potential for the future". Cree says that he "enjoys all the different tasks and the challenges that he comes across each day". Cree attended Swofford Career Center with a focus on welding.